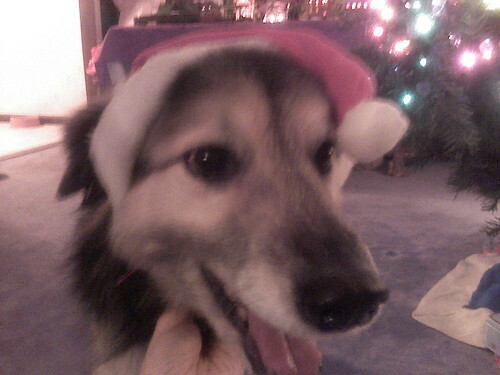 Santa dog, originally uploaded by eblackwell. Morgan helped with the decorating last night! You gotta love that my hand has to hold her to get the picture, because she kept wrestling with Elphie and with the hat to get it off. Stylin!, originally uploaded by eblackwell. 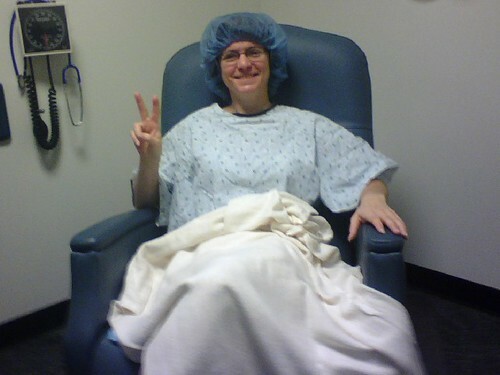 That’s me, ready for surgery. Tell me that doesn’t say “Norman Rockwell Christmas card”!! Everything went fine on Friday. The staff at the surgery center were wonderful to me, and you haven’t lived until they hand you your bra in a BioHazard bag! (They told me I could keep my underwear, but apparently that didn’t mean my bra. I had to take it off in the operating room, and the Bio Hazard bag was the only storage thing available. LOL!) John has been a phenomenal nursemaid! No complaints and always there for me, no matter how nasty the bandage was or how many times I needed ice chips for my dry mouth and throat. (Breathing through your mouth is a pain.) He’s got a picture of me before surgery which makes me look like his 90 year old Grandma Verducci! And a thank you to my other nursemaids: the dogs. They stayed to my side the whole weekend, watching over me. Elphie wouldn’t even leave me to eat! We brought her bowl into the bedroom before she starved. And there’s nothing like sleeping in a pile of furballs to make you feel secure. It’s taking me a bit longer to recover than I thought it would; I expected to be up running around on Sunday and I was far from that. The dizziness was so bad along with the congestion and pressure pain that I had to take the day off on Monday and felt like it again Tues.
My company doesn’t do sick days vs vacation etc, but one pool of days off; the only one I had left were for the December trip. I thought I got lucky when an surgery opening was available for the Friday after Thanksgiving. No need to take time off!! I’d be back on my feet by Sunday! Yeah, I would be…. if I had just had deviated septum surgery, but with the rest of it, no such luck. I had to take a day off Monday, as I said, so now I’m begging my boss to let me do a day off with no pay for vacation! Otherwise, I have to come in! They HATE time off with no pay, and they give it as often as Lindsay Lohan actually sticks to her rehab! That’s why I came in on Tues, so I didn’t make John and my sister have to come home from Florida early, and I’m glad I did. I made it through the day and it’s easier to ask for 1 unpaid day off than 2. I have a follow up appointment for Thurs night, where they will clean out all the sinuses. They said I won’t believe how good I will feel after it. I can’t wait to get that “rotor rooter” treatment! I hope it really will mean the end of all this. I’m a feeling a little better today: the dizziness is gone! I have the congestion and pressure pain, but I’m a pro with those by now. And I’m used to juggling my work’s PIA policy on sick days, so I’m through 1 day and have good hopes for the rest of the week. I haven’t heard yet from my boss about giving me that 1 day yet. Keeping my fingers crossed! John surprised me by bringing in all the Christmas decorations and getting the tree up with its lights! Tonight, I’m putting up the village! The hospital center just called: I have to be there at 10:30 on Friday. Since this has been getting closer, I’ve getting nervous. Nothing terrible, but it was one thing to hear my doctor say I’d be uncomfortable afterwards. I’ve found out “uncomfortable” means “a lot of pain”, and with the packing, I won’t be able to breathe that way. And I have this tiny nagging voice that reminds me they couldn’t guarantee I’ll be better. So what if I go through all this, and I’m not better? But cringing from the thought of waking up in a lot of pain on Friday, and the slim odds that I won’t be better is foolish. Other people are in a lot more pain and worse surgeries; I can deal with this (my head’s splitting now, actually blinding with pain, so what’s the difference?). And everything the doctor discussed describes my symptoms; fixing those problems will have to bring some relief. Still, I’m glad John will be there with me, and I’ll be glad to get home to my bed — and some painkillers. 🙂 And it’ll be wonderful when it’s all over. I set a goal for myself back in the summer. I would finish the fan novel I have been writing off and on for five years by Thanksgiving. I have four chapters left to do and Thanksgiving is 3 days away! I was doing really well for awhile; I’d get a chapter done every week. Then we had such a bad late summer and fall that I couldn’t get my head together. Even so, I had no idea that I got nothing done in October until I checked the dates. Just like I didn’t realize how long I had put this thing aside until someone asked. Five years! That made me determine to get it done. Fans of it were certainly thrilled and that spurred me on so much. I have 2 of the 4 chapters done in rough draft, another one in notes, but the final one will be all made up because I can’t find my notes. It’s my own goal, nothing will happen if I don’t do it, except that I will know that I failed. And I really would like to go to Thanksgiving knowing I did this accomplishment. Come on vacation with us! Well, not literally. You could, we have an extra bed, but you gotta love dogs. On the other hand, you can come virtually on vacation with us. We have a vacation blog where we will send posts, photos, and videos from the trip. We’re even posting now about our preparations. When we get at a place with wireless, I’ll set up our webcam! Then, when we come home (don’tthinkaboutit, don’tthinkaboutit, don’tthinkaboutit), we’ll have this to read over and visit for the memories.